Artichokes — Try grilling these beauties. Cut in half, lengthwise. Steam for 15 minutes or until leaves can be pulled off with minor resistance. Brush flat side with a mixture of olive oil, fresh lemon juice and fresh mint (optional) and place flat side down on the grill. Cook 4-5 minutes, turning over once. Asparagus — Grilled, steamed or sautéed, this is a spring staple in our kitchen! Beets — Spring beats are great thinly sliced and drizzled with olive oil or roasted in the oven and tossed into a spring salad. 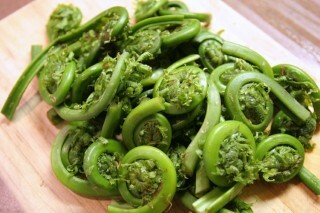 Fiddlehead Ferns — These funky looking vegetables come with a serious warning: never eat them raw! However, they are delicious steamed, sautéed or pickled. 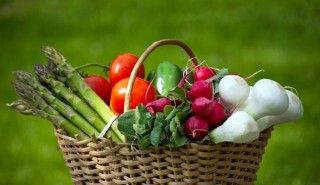 Sweet Peas — Love spring peas! They are sweet and tender and so easy to prepare! 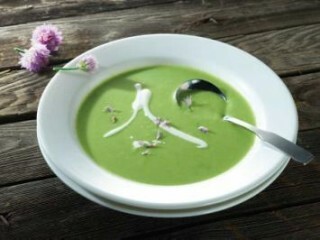 During a recent cooking class taught by Chef Daniel Porubiansky of Century House Tavern in downtown Woodstock, he shared his Chilled English Pea Soup recipe. Your guests will love the bright green color and smooth consistency of this easy-to-make- recipe. In a large pot, over medium heat, melt butter and saute onions, stirring frequently for two minutes. Add peas, saute for one minute. Add water and bring to a boil. Season initially with salt and pepper. Add cream and return to a boil until peas are al dente. Immediately remove from the heat, blend with a stick blender or countertop blender (be careful not to fill blender too full with the hot soup or it will explode!) Strain through a fine strainer into a bowl that is sitting in a larger bowl of ice. Add additional salt and pepper to taste. Refrigerate until ready to serve. Top with yogurt sauce, recipe below. Whisk ingredients together. Pour into squeeze bottle and drizzle on soup for a tangy soup topping.